Some context: I had recently posted on Facebook asking people to name women-owned businesses or women-led organizations in the area (bonus if led by a woman/women of color). The response was overwhelming, amassing hundreds of comments over the first day or so, with tags abounding. Business after business, nonprofit after nonprofit, group after group, all led by women. These women were connecting in the comments, asking where the potluck was where we could all meet in person. 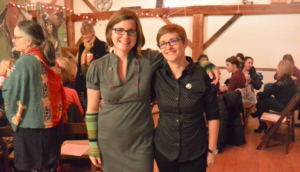 I was in the early stages of building Feminist Oasis, the business I founded earlier this year, and this was a huge moment of confirmation that there was a need for a feminist space in the NH business world. It was great to scroll through and see all of these badass women, representing every industry in our community. This thread had exploded maybe a few days before this yoga class. So I was extra aware of this mostly-female-led community that I was a part of at this class. That’s the mindset I was in when I was meditating on the mantra of the evening. I don’t remember the specific mantra that night, but a common one in Kundalini tradition is “Sat Nam” — roughly translating to “truth is my name/truth is my identity.” It was likely Truth that I was meditating on this day when this vision popped into my consciousness. It was an image of myself, lifting up all of the amazing women in my community, while they, simultaneously, were lifting me up, too. It was like a never-ending magic mirror of cyclical image — I was being lifted up and supported by them as they were lifting up and supporting me. It was overwhelming, resonant, comforting — TRUE. It was my truth. I have returned to this image, this vision, several times over the past year. I relayed it to Melanie, my accountability partner in the Sister Feminist Business School course, Concepts and Conception, that I took this spring. It resonated with her, too. And hearing how much it moved her reminded me that it was indeed a special vision that I should hang on to. At the time when I had it, and each time I remembered it, I took it to mean that this support network of (mostly) women (and expanded, I think, to include feminists of all genders, representative simply of the community with which I surrounded myself) would always be there supporting me as I needed, and I would continue to invest my energy to build up these friends and neighbors, too. Another precursor to this image came nearly a year previous. January 20th, 2017. Some may recall that date as a certain inauguration — but it was a date that I organized an event called “women, empowered” at The Word Barn in Exeter. I created it as an alternative for folks who wanted a safe place to be with like-minded members of their community on what was going to be a hard day for me, and, I suspected, for many others. That event was an incredible milestone for me and ended up being exactly one year before our first Feminist Oasis event (Lemonade + Feminist Theory, which happened 1/20/18). At this 2017 event, one of my dearly beloved volunteers from the 2016 campaign, Paula, shared HER vision. She said that when she was raising her children, she had no bandwidth left over to do any activism or be involved with her community — it was all she could do to keep her kids fed and the house cleaned, and everything else she had responsibility for. But now, she was able to give extra time, as she had throughout the 2016 campaign, showing up multiple days per week to support the campaign (and keeping me personally fed and sane and supported, for which I will forever be grateful). “I’m doing it now for the women who can’t do it. And someone was doing it for me when I couldn’t.” She painted an inspiring picture of a world where we’re all carrying the baton during the times we can, knowing that it’s okay when we can’t, because there will always be others to take up the cause in our absence. I’m sure Paula’s words were in my psyche when this never-ending cycle of lifting each other up came to me in that yoga class. Because that’s what it is — a cycle, carried on from one person to the next. Lately, I’ve been experiencing some profound discouragement. Even though I’ve set out, through Feminist Oasis, to build a movement centered around individual and institutional resilience, I still find myself burned out at the end of this first, very full, year of organizing. When energetic depletion coincides with financial stress (nearly inevitable in the early stages of building a business), it can be hard to remain confident in the path you’re on. But here comes my community of feminists, reminding me that I am never not supported by them, as I am never not supporting them. Once again, in what I believe will be a Truth forever, this vision became a reality this week. 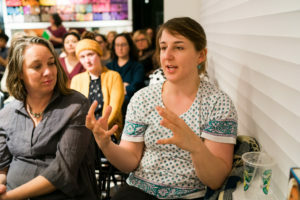 At our first Feminist Book Club, Jocelyn, who is now a member, said “Coming here is crucial to my existence.” She explained that amidst some personal struggles, having this space created for feminists to come together and talk about important feminist issues was what was keeping her going. I felt so grateful to be a part of creating that lifeline for her. If you’ve followed Feminist Oasis, you already know that we love Libby VanderPloeg — she makes lovely gifs, and in particular, the animated gif titled “Lift Each Other Up.” I’ve often said that if Feminist Oasis could be summed up in a gif, it would be this one. My co-conspirator and constant support network, Alexandra, and I share Libby’s gifs constantly, with each other and our Feminist Oasis community. This never ending cycle that I told people never really made sense logically — I mean, how can you be holding up others at the same time as they are holding you up? — actually makes all the sense in the world, as this gif. To borrow Jocelyn’s phrase, the practice of lifting each other up is crucial to my existence. As feminists and as humans, these reciprocal support networks are crucial to our existence. At the end of this difficult yet fantastic year, I have so much gratitude for all of this — for Jocelyn, for Paula, for Alexandra, for Gail and Erin and this entire community of feminists, for the feminist leaders of the past that I am constantly discovering and finding new inspiration from. My wish for all people going into this next year is that they have, find, build, maintain — get and keep by all means necessary — the support networks that will carry them through their existence. We exist to lift each other up. Because as we do, we are lifted up, too. It makes sense. Just look at the gif! With profound gratitide to Libby VanderPloeg, artist behind the “Lift Each Other Up” gif, and to the always-#goals duo, Aminatou Sow and Ann Friedman, co-coiners of #ShineTheory.